John Gardner is the mayor of Aynor, South Carolina (population 763), a purchaser of beer, and a mower of lawns. 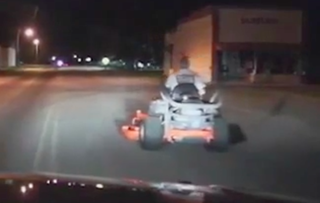 Late last month, Gardner was pulled over by police while riding a lawnmower through Aynor, in addition to possessing some beer, a situation that was caught on dashcam video. There is some dispute as to whether the beer was open or not, but Gardner told The Sun News last week that it was not, which doesn’t really make any sense, but sure. Gardner was not arrested or charged with a crime. Gardner says he was not cited, and the video shows officers saying they would call the Town of Aynor to handle the situation. Gardner, who was elected in 2016 and who is up for reelection this year, said he had put gas in the lawnmower after cutting his mother-in-law’s grass, and picked up the beer at the gas station. He said he thinks he was pulled over because the lawnmower had no lights. Be careful out there after dark, if you’re riding a mower and in possession of some beer. Remember; safety first.